I was a little skeptical when I opened the Christmas gift from my brother and saw what looked like a cordless drill. It was actually a Craftsman "cordless inflator" - a portable air pump that uses the standard Sears 19.2 volt battery system. I had no doubt that it was a reliable piece of equipment, but given its small size, how could it be an effective tool for inflating tires? As it turns out, this little guy can move an amazing amount of air in a very short period, and has replaced the floor pump that I previously used to inflate our bicycle tires, as well as the 12-volt inflator I used for bigger jobs. The inflator has a built-in pressure gauge, and the unit is rated to 200 psi, meaning it easily inflates our 110 psi bike tires. And did I mention it moves a lot of air? Earlier this week, the tire pressure monitoring system on my Honda Ridgeline indicated that one of truck's tires was under-inflated. It took less than two minutes for the Craftsman inflator to bring the tire's pressure from 27 to 31 psi. The inflator also has a nifty automatic shut-off feature that allows you to specify a pressure setting that turns off the pump once that pressure is achieved. The only caveat is that the pressure gauge accuracy needs to be calibrated. In the case of my unit, the gauge reads 4-5 psi high, meaning that I need to set it for around 35 psi to achieve 30 psi (I determined this by using the Ridgeline's built-in pressure monitoring...assuming that it's accurate. But I also double-checked it with a pencil gauge.). But once you know the adjustment, operation is a no-brainer. If you already have tools that use the Sears 19.2 volt battery system, this inflator would be a very economical and useful addition to your workshop or garage. The unit comes with a battery, but it doesn't include a charger, so you'll need to factor in that purchase if you don't already own any related products, and those chargers are not inexpensive. I think I need one of those. I'll have to figure out why....but I'm sure it would appeal to TMIL's "need for more gadgetry". Maybe a great Valentine's present? Be still, my beating heart...for lo, what breaks over yon toolshed? 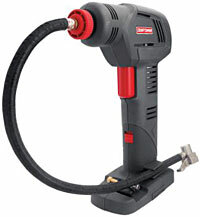 It is a power tool, and love is its energy source! A good gadget is self-justifying for ownership. This page contains a single entry by Eric published on February 5, 2011 10:28 AM. Random Thursday - The Cold Weather Edition was the previous entry in this blog. Super Bowl Live-Blogging is the next entry in this blog.